Sale Grammar School aims to provide students with an integrated learning experience to equip them with the appropriate knowledge and skills for today's business world.With this in mind, the school has formed a number of working collaborations with local, national and international companies.The school works closely with these indusrty partners, including a range of firms and organisations that are already delivering excellence in the most testing of learning areas: the competitive market. Year 9 Gifted and Talented scientists were delighted to find out they were winners of the BOC Annual Science Challenge. Competing against other schools across the North West, the team designed and built a water rocket and launcher which sent their rocket over the furthest distance. Chemistry teacher Mr. Guinan commented "This was a great achievement. The students had really worked hard, putting many hours of effort into the project. It's wonderful to see that recognised in this award." Year 10 students have participated in the school's annual Young Enterprise Day. Teams of students competed against each other making and trying to sell different product prototypes aiming to be the group with the most profit at the end of the day. The action-packed day was an opportunity to experience life in a business atmosphere with the teams learning useful and transferable skills such as team building and communication skills. The students enjoyed the day tremendously and the activities they took part in helped them understand more about business in the real world. 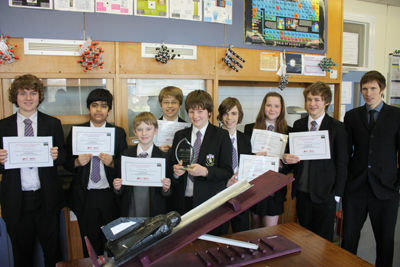 A group of ten, Year 10 students were overjoyed to discover they were the winners of BOC's annual Chemistry Challenge. BOC, the largest industrial gas producer in the UK, invited the students to an introductory meeting at their Cheshire headquarters, where company representatives took them on a tour of the plant. They were then set the task; to cool air from seventy degrees centigrade to as low as minus ten degrees, a task performed by the company on a daily basis. With a budget of £250, the group set to work! The team committed to meeting after school two or three nights a week and showed their dedication to eventually beat stiff competition from three competing schools with their original design which successfully cooled hot air by more than ninety degrees centigrade. In recognition of their enthusiasm and success, the school has been awarded with £250 prize money, which will go towards improving science facilities. The students were delighted with their success and have proved that they are able to put their knowledge of science to a practical solution. Recently a group of talented Economics students were chosen to represent the school in a national competition. The Target 2.0 competition run by The Bank of England challenges students to think of new and innovative ideas of keeping the interest rate at 2.0%. The groups have to research and plan their ideas before presenting them to several high ranking officials from The Bank of England, with the winning team advancing through several stages. The overall prize for the competition was a cash prize for the school. The team this year, led by Miss Hall, was made up of eight Year 13 students who are currently studying Economics. The presentation was carried out by Kate Mayall, Matthew Heeks, Aaron Shaw and Billy Goodman, backed up by the research carried out by the remaining team members David Laybourn, Charlotte Edney, Jonathon Higham and James Chan. While unfortunately the team did not manage to progress to the next stage, the hard work and effort they put in was evident and Miss Hall said she was extremely proud of the commitment and enthusiasm with which the team approached the challenge. Team member Kate Mayall said "I really enjoyed taking part in the competition as the practical example really helped to back up the theory we had learnt in lessons." Sale Grammar School Sixth Form Product Designstudents are moving up in the world of graphics! Suttons, a local financial firm based in Sale asked A Level students studying Product Design to come up with a new company logo. There was a high standard set across the board with brilliant designs being created. There could however only be one winner - Ben Webb with his simplistic design representing investment returns rising. Joe Burnham took a close second and Miles Harrop came in third. Suttons commented "We were very impressed by the quality and finesse of the students' design work which could easily have been produced by a real design studio." The financial firm have now adopted Ben's design as their official logo. This is an honour for the Design and Technology Department and really highlights the excellence of standards that our teachers and students produce. A group of Year 12 A Level students were lucky enough to experience what life is really like in a chemistry lab. Accompanied by Dr Davies, they attended the spectroscopy outreach day at Manchester Metropolitan University where they got some hands on practical experience. After exploring the theory behind biodiesel the students donned their white lab coats and safety glasses and under the watchful eyes of the Chemistry lecturers, created their own biodiesel form simple shop bought vegetable oil. They then got to analyse the results of their experiments using a variety of machines including Infra-red spectroscopy and NMR, both of which are very advanced techniques which most people do not get to experience until degree level. This really helped to reinforce the learning they had done in the classroom and will be invaluable come exam time. The day was enjoyed by all, and the students were very grateful for such an opportunity. Becky Crowther who attended the trip said "It was fascinating to work in a large lab and the day gave me an opportunity to experience the practical side of Chemistry, which I thoroughly enjoyed".